We‘ll try to post here an overview of the applications build around the pChart library that are processing real world data. If you‘ve made an application and want to be published here, just create a post on the forum! 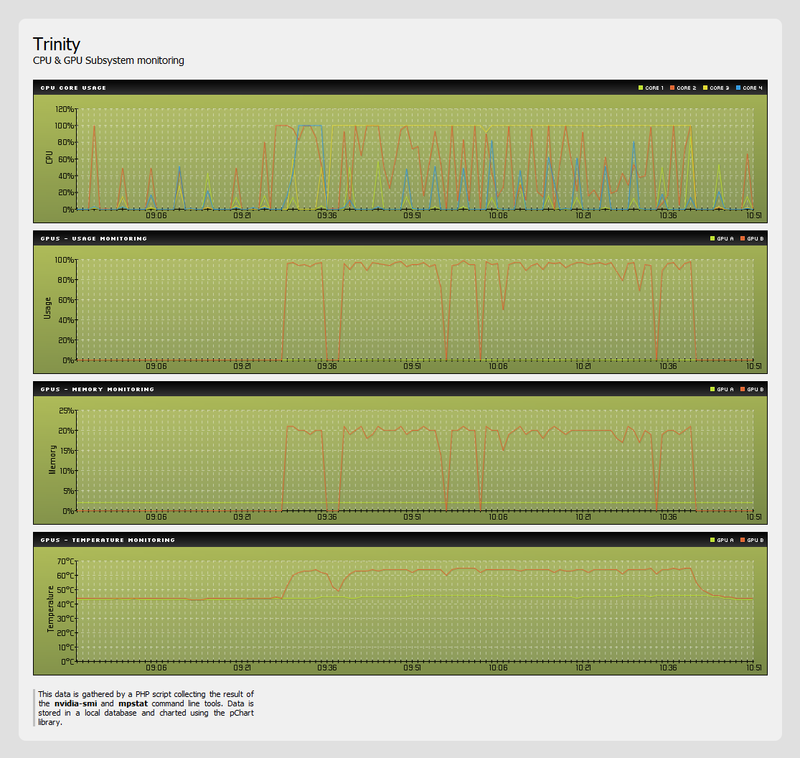 Trinity is an x64 server used for bio-informatic analysis. All the tools installed on it are configured to use the nVidia GPU technologie to get astonishing speed results. 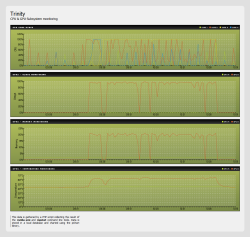 This web interface is monitoring both the physical CPUs and GPUs processors. Computing units memory and temperature figures are also gathered. Data points are gathered from the shell commands nvidia-smi and mpstats. The values are stored in a flat MRTG-like database file with a rotation of 2 hours then charted on-demand with the pChart library. The gathering script is triggered from the crontab interface at regular interval. pCache isn‘t used due to the system robustness. Intreresting... It is statistics system for computer resources, but RRDTool is replaced by PHP+pChart ? Long time ago I‘ve made an SNMP poller that was doing the same than MRTG (automated data gathering, database storage & chart generation). This script is an alternative to MRTG, RRD, Cacti, .. It‘s a lightweight version of all those applications.